Cleopatra a woman that made history during her lifetime and is one of the most iconic women known. She is remembered for her power, leadership and exquisite beauty. 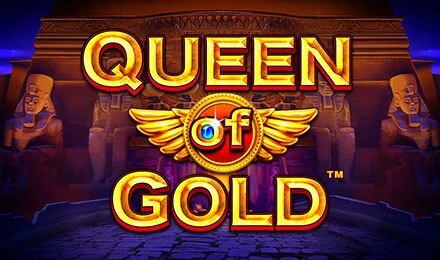 Queen of Gold slot is thoroughly themed around Cleopatra, and this takes you to visit popular Egyptian Gods as well. Launch the 6 reels and 25 payline game, which comes loaded with a variety of bonus rounds and feature to enhance your gameplay. As you level up on the game, keep in mind that Cleopatra symbols could offer you up to 100x your stake! Symbols you will find landing on the reels are; Bastet, Anubis, Horus, Queen Cleopatra, Pharaoh Tombs, Pyramids, A, K, and Q. Launch this game at Wicked Jackpots Casino - the best online casino and enjoy the wonderful feel the game gives off! The options present in the game will help you facilitate your gameplay. Select your desired bet on the Bet Field and bet levels using the + or – symbols. The Autoplay option allows you to play the game hands free by setting from 30 to 100 auto spins to play. Bet Levels: Bet levels are available from 1 to 10. Amount of Paylines Selection: All 25 paylines are fixed and cannot be changed. Coin Values: Adjust your stakes from the least amount of £0.01 to the greatest amount of £0.50. The Wild symbol of the game is the Pharaoh’s Tomb, which replaces all other symbols bar the bonus symbol. The bonus symbol is the Pyramid, which triggers the Free Spins Feature of the game. Trigger the free spins feature by landing three or more of the Pyramids anywhere on the reels. 10 free spins are awarded and the multiplier that triggered the feature remains in play. Retrigger the feature by landing more bonus symbols during the Free Spins play. The 6th reel on Queen of Gold slot is the Multiplier Reel. As you spin the grid, this reel remains in play. Wins are boosted by the multiplier the game has stopped on. Values range from 2x to 10x, but increase as you level up in the game. In the middle reel, a circle is positioned. Landing Cleopatra in this circle will collect her symbols to help you level up. You could also level up when a joker symbol lands on the multiplier reel. The circle may be moved around the grid to wherever you think is fitting. Enjoy the company of the queen and gods on Queen of Gold slot! Now you can dive into the world of gold, riches and more at Wicked Jackpots Casino!